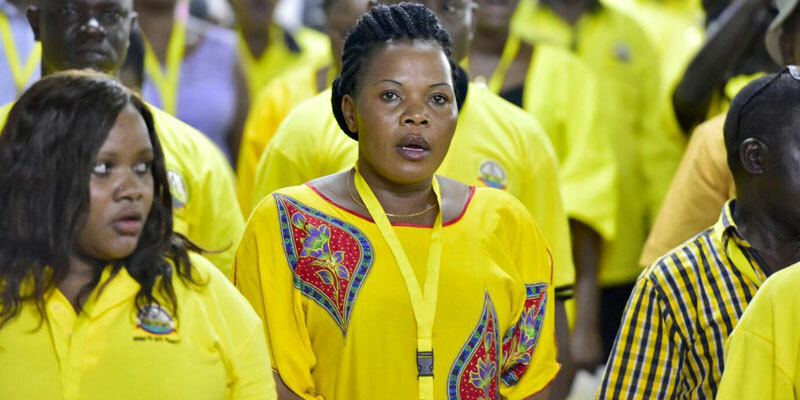 KYANKWANZI – NRM Legislators on Tuesday, March 19 approved linning-up as a mode of election for all internal elections and recommended for the amendment of the Party Constitution to accommodate the changes during the National Delegates’ Conference scheduled towards end of this year. In their general resolutions, the Parliamentarians commended & saluted the Party’s Central Executive Committee (CEC) for leading the way during the Chobe Retreat, for these resolutions they were adopting at Ngoma State Lodge, Nakaseke District. The MPs together with the National Chairman & President H.E Yoweri Museveni today trekked over 100Kms from Kyankwanzi to Ngoma State Lodge where the resolutions were read and approved by members. The final resolutions were read in presence of the President and National Chairman of the party H.E Yoweri Kaguta Museveni. The resolutions titled NRM Ngoma Resolutions 2019 were read out by the Caucus Secretary and Bukoto Mid-West Constituency MP Hon. Kasozi Muyomba. The MPs recommended the deepening of ideological study within the caucus and the NRM at large. They further resolved to urge the Government to ensure the development & implementation of an expanded education Curriculum in all institutions in order to cater for Patriotic & ideological development in the country. To deeply appreciate and salute the leader of our revolutionary & our Movement, as well as President Gen. Yoweri Kaguta for his visionary, bold, courageous, steadfast and consistent leadership of our people in their struggle against dictatorship and for democracy & freedom. To urge Government to urgently study the introduction of the National Service for the Youth. To fully support Govt. to do everything to bring down the cost of electricity to at least US5 cents for manufacturers. To work to ensure that our economy of the four sectors of Commercial Agriculture, Manufacturing, Services and ICT – absorb and render useful all our active population so that they produce goods & services for import substitution and export promotion etc. To support Govt in ensuring a more investor-friendly atmosphere, free of delays & corruption of public officials; and more wealth funds to convert our idle youth to owner of the small businesses across the four sectors. To urge Govt to provide ICT & social media training for MPs. To urge MPs and orher leaders to actively take up the use of social media. To urge close monitoring of social media activities by the state.